General information about Australia - Hazards. 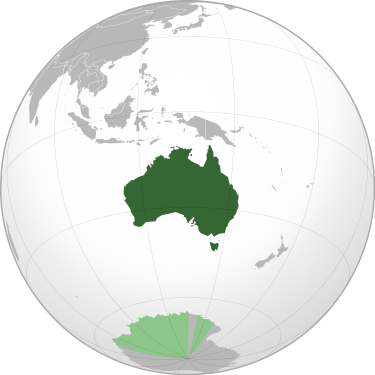 Australian travel information. Information about general hazards that maybe encounterd by travellers and visitors to Australia. Travellers tips for visitors. You may encounter hazards of the climatic and animal kind, even in the parks and reserves of towns and cities, but especially if you go bush or head off the beaten track. Fires and Floods can be testing for locals, let alone visitors unprepared for a natural weather event. Our creepy crawlies are renowned the world over, and often irrationally feared, while the beach, with our sun, sand and surf, has its own way of dealing with the unwary. Public service announcements regarding weather conditions are usually broadcast on local radio and television, and our emergency services provide a range of emergency responses. Australia has one of the best civil emergency systems in the world. Each state has the State Emergency Services (SES) or equivalent, with coastal waters (Coast guard) and Beach (surf lifesaving) Patrols, Rural Bush Fire Brigades and Rescue Helicopter services, while the Royal Flying Doctor Service serves the more remote and outback areas. A good percentage of the funding, sometimes most of it, and much of the people power for these services comes from the local communities they serve. If you are involved in an emergency and get instructions from a member of these services, please listen to them. Even in populated areas, people can get lost or come to harm. Our volunteer civil emergency services don't enjoy rescuing ill prepared visitors (even fellow Aussies), who have failed to make adequate preparations for their excusions, or ignored warnings, whether it's a day trip climbing Mount Warning or a safari into the Great Sandy Desert. If you intend to go to a remote area, drive off the beaten track or go bushwalking without a knowledgeable local guide, please make sure that at the very least, you let someone know where you are headed and when you expect to return. Make sure a schedule detailing your expected route with approximate departure and arrival times, is left with your accommodation or another reliable contact. If possible, carry a mobile phone, or see if the National Parks or other local service for the area you're going into, offers a Personal Locator Beacons (EPIRBs) hire scheme. If you do require emergency service, dial 000 (triple zero), ask for Ambulance, Fire or Police, and follow instructions. See also Medical Services. "Bush fire season" runs from September to March (late Winter, Spring and Summer) in south eastern Australian states (NSW, VIC, TAS, SA and southern WA). Ironically, it's are a major hazard in rainforest country too, especially if the ground litter has accumulated and it's been dry for a week or two. Dry gusty winds, warm from crossing the Great Australian Desert, can fan a small ember into a major bush fire in minutes anywhere in Australia, even during "the wet" season in northern Australia. In our national parks, state forests and reserves, please use designated fire places or bring your own gas cookers, and refrain from tossing soft drink bottles, matches or cigarette butts out the window while driving! "The wet season" runs from December to March (Summer) in northern NSW, QLD, the NT and northern WA states. Tropical cyclones (aka hurricanes, typhoons) are becoming more common in northern coastal New South Wales, as they sweep south from tropical north Queensland, causing flooding, destructive winds, storm surges and loss of life, in their wake. 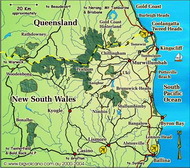 They have been known to make landfall as far south as Coffs Harbour. If you head into our tropical and subtropical rainforest regions during the traditional "wet season", then be prepared for ... RAIN! Rivers and creek crossings have designated markers, showing in metres, the depth of the water that can flow across the road at that point. Don't attempt to cross a flooding water course; depths and current speed can be deceptive. People have been trapped and drowned in their vehicles while attempting to cross a flooded roadway. Also stay clear of storm water drains and culverts. Autumn and winter is the major storm season in south eastern Australian states, from the NSW mid north coast/Hunter region south to TAS, VIC, SA and southern WA. Unsettled conditions including strong winds, rain and snow, are driven north from Antarctica across the "Roaring Forties" in the Great Southern Ocean, into the Great Australian Bight and make landfall in SA and VIC. From Mid Autumn to late winter an infrequent phenomeom known as an "east coast low"(similar to a cyclone), occuring off the east coast from southern QLD to TAS, can create havoc for shipping and cause a heavy rain event on land. Local media will issue alerts, and the SES provides advise on how to prepare for and manage emergency weather events. Don't be fooled when your well travelled gap year friend or their local mate*, tells you with a straight face, that when you're going on a bushwalk, you must watch out for the "Drop Bears"; a carnivorous cousin of the Koala, which drops out of the trees on the heads of unsuspecting tourists, and mauls them. "Drop bears" is actually a reference used by older "bushies", to describe how branches can drop without warning from some of the tall eucalypts tree species that have a "dropping" habit. So when deciding on the best camp site, make sure to look up and check if that nice shady spot you've grabbed under a tree, won't be the cause of your very own "Drop bear" close call - or worse. *Or the Australian Museum when you look it up. Snakes, spiders, ants and other insects are busy during the Summer months, but may be encountered at anytime of year, especially on sunny days and during extended warmer weather. Australia has the world's most venomous snakes and spiders. However, we also have the world's most comprehensive anti-venom treatments. Like their brethren the world over, Australia's snakes are more afraid of us than we are of them (thank goodness), and will generally only attack if surprised and unable to escape, or if they have been cornered and provoked. When heading into the bush, be prepared for the usual hitchhikers like leeches during “the wet” (Summer and Autumn for subtropical and tropical Australia), and bush ticks during “the dry”. Bush ticks can be especially nasty if not recognized and removed. Some species of ants are aggressive, and you may find your ankles and legs being quite savagely bitten by these small warriors. Learn to identify their tral and avoid their nests. Thick socks, sturdy footwear and a spray of insect repellent around the ankles usually reduce risks. In Northern NSW and SEQ, exotic and harmful Fire Ants and Yellow Crazy Ants have made some suburbs their new home. If you see flagged nests, stay clear, and also make sure you don't accidentally transport these pests into new areas. Some people may also react badly to sandfly and mosquito (mozzie) bites. Barma River Fever and Ross River Virus occur from this region through to tropical northern Australia, so take precautions; wear long sleeved clothing and use insect repellent when outdoors, on our waterways or down at the beach. Aahh ... the beach. 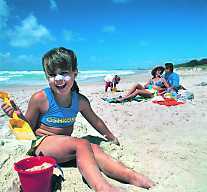 Most beaches in popular tourist areas have volunteer life guard patrols during school holidays, and throughout summer. Please swim between the red and yellow flags, and discuss the surf conditions with the life guard on duty if you are unsure of the safest place to swim, as rip currents can be frightening and pontentially deadly. Australia's light is like no other, be Sunsmart and slip on a shirt, slop on sun screen and slap on a hat. Even in the bush or on overcast days, Australian sunlight can be harsh, especially if you're coming from a cooler climate. You can still get that enviable tan without spending your holiday feeling hot and painfully uncomfortable from sunburn. Just exercise some Sun Safety, be sensible about exposure - especially between 11am and 3pm, and pay heed to public service announcements. Many swimming beaches, especially in QLD, have "shark nets", ostensibly to keep sharks away from swimming areas. These can result in the ensnaring of whales during their migration to and from Antartica, and drowning of other sea life like dophins, turtles and manta rays. Some species of sharks and rays also inhabit estuaries and rivers in this region, so caution is also advised in tidal creeks and canals. In northern Australia (QLD, NT, WA), watch out for "croc's", especially "freshies" and "salties" (fresh water and salt water crocodiles), although popular affected billabongs (water holes), rivers and beaches will be sign posted. Various stinging jellyfish are also water hazards at various times of year, depending where your are. Ask your accommodation or check local public services if you are unsure. YouTube video: "Copacabana Rural Fires Station". Bank of Goodwill, published on Youtube on 7 May 2014. YouTube video: "Ex-Cyclone Debbie's Flooding Footage Towns underwater (30 + 31 March 2017)". Climate State, published on Youtube on 31 Mar 2017. YouTube video "How to Spot a Rip Current". Surf Life Saving Australia, published on Youtube on 4 Oct 2016. YouTube video "Top 10 deadliest animals in Australia". Tanveer Studio, published on YouTube, 8 May 2017.